Blank ‘threshold of acceptable risk' chart in appropriate language. This is an exercise that helps participants explore risk and threats in depth, and to assess their own perceptions of risk and the impact of potential threats. It can also be used on a flipchart to simply explain the concept of risk ‘thresholds’. Explain that the ‘threshold of acceptable risk’ was first developed by Koenraad Van Brabant in the excellent Operational Security Management in Violent Environments. The example shown below lists just a few of the types of threats that one might assess. Ask participants to list five priority threats currently affecting them as individuals. After each threat, write down the ‘likelihood’ of the threat being realised – that is, that the threat would turn into action. Next, after each threat, write down what ‘impact’ the threat would have on you if it were realised. 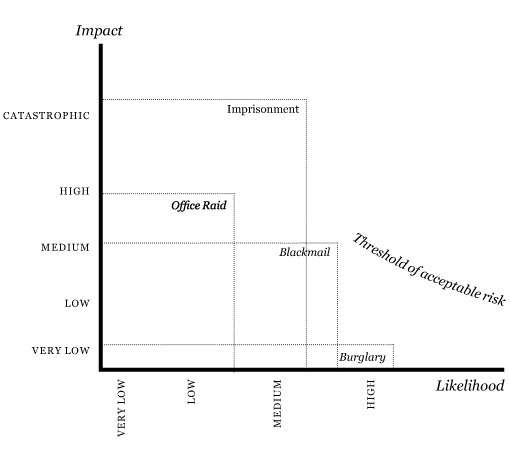 Then, ask participants to complete a blank version of the ‘threshold of acceptable risk’ chart (or put this on a flipchart), placing the threat in the position that relates both to its likelihood and its impact. This will indicate the degree of risk posed by the threat. The degree of risk is greatest in the case of an incident that is most likely to occur, and that will have the greatest affect on you, your organisation and your work. Finally, participants should draw the line where they locate their threshold of acceptable risk – the point beyond which the risk is simply too high to continue an activity. Once each participant has completed their own chart, facilitators should lead a discussion around the concept of acceptable risk, and ask participants what surprised them in this process. The risks listed in the chart below are examples only. Facilitators should use examples of other challenges or threats that arise in the workshop discussion, such as: slander, serious illness, threats to family members or loss of livelihood. This chart can also be used in a group discussion – to introduce how risks become considered as ‘acceptable’ and inevitable parts of the work, without a conscious analysis of their real consequences. The exercise could also be used in small groups, as described above for individuals.